I was going to make these little owls out of mini cupcakes and mini Oreos, but the mini Oreos just weren't working for me(there wasn't enough fluff)! So, I rummaged through my big butcher block drawer that holds a lot of my baking goodies and came across a container of mini(lots of mini things in this post:)) peanut butter cups from trader Joe's. Perfect! I decided to forego the cupcakes and make the owls on a smaller scale with the supplies I had on hand. By the way, the darling owl card( in the photo above) was part of a set, downloaded for free. I found the link here on craftgossip.com. Each mini peanut butter cup measures 1 1/4" across, for the head. The eyes are regular sized m&m's, the beaks are chocolate covered sunflower seeds(I was so happy to find them at Michael's), and I put the mini Oreos to good use by cutting one wafer in half for the ear tufts (I actually looked it up to see what they are called). Wilton's black Sparkle Gel was used for the pupils. A small dab of chocolate frosting was used to adhere everything to the peanut butter cup. So simple and so cute! I think I like these little critters better than the owls I had originally planned. There's not even any baking involved, so they were a snap to put together. These would be a perfect tiny treat for classmates or for your favorite little Valentine:) Happy Heart Day to "owl" of you! 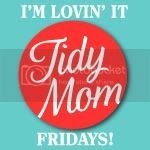 and to Tidymom's "I'm Lovin' it Fridays" bloghop! It's the best linky party in town, so come join in on the fun! Oh my gosh, one look at your picture and I can't stop smiling. It is just too cute. I'm amazed at how you're always finding the most adorable ideas I've ever seen and then you carry them out and they're just so good. These are so cute! :) Thanks for sharing. AWE, those are the cutest things ever! Great idea using the p-nut butter cups - candy is always perfect for V-day! so cute!! owls are so in right now :) I made them with chocolate covered oreos over the holidays and they were fun and pretty easy....love the mini peanut butter cup idea tho...my kids have nut allergies but maybe i can find some filled with other good stuff! Those are a hoot!!! Love them!!!! SO STINKIN' CUTE!!! I love these. You are so darn clever!!! These are just adorable! You always come up with the cutest ideas. What a cute OWL!!! Very creative. I love it!!! I am going to make these for my daughters preschool valentines party! I love that thre is no baking! I saw this on Tidy Mom "I'm Lovin it Friday"
oh my goodness, these are adorable, so fun to do with kids. So fun! I'm in love with these little guys! Oh, I loved owlgebra too! These are such cuties, I could just eat them! I absolutely adore these! Love, love, love them! Your photos are perfect. In a dream world I would show up on your doorstep with an empty basket and ask you to fill it with your lovely treats. In the real world, I'll just be on my elliptical. :( Btw, you were correct, that was my photo of the jars of granola with the ingredient labels on them. Could they be any cuter, I don't think so. So creative Sue lovely work. Those turned out so well. What a cute, cute, cute idea. Sue! Congratulations! I’ve awarded you with a “Stylish Blogger Award!” If you chose to accept please visit my post: http://liliannagrace.blogspot.com/2011/01/blogging-share-fun-love.html Grab the “Stylish Blogger” photo, and follow the rules. Thanks for being such a fantastic blogger! You always have the cutest treats. I love them! Thank you so much for coming by and linking this up to Sweets for a Saturday. I truly appreciate your support. Hope that you'll be able to join in again next week. By then, I'll have a cute button that you can grab and add to your post. You see, you got so creative with all the nitty gritty things... lovely creation! These little Oreo owls are cute. You are so creative with all these cake and biscuit details. These owls are just too adorable with their big eyes and pink noses. Sorry the mini Oreo idea didn't completely work out but I think yours turned out better this way anyway. These are SO adorable - love 'em!! Where do you come up with this stuff?!? LOVE LOVE! those are too freaking cute!!! These are so stinking cute. I love anything owls, so so adorable!!! These little dudes are so cute! I can't decide if they look angry or not, their expression is just so funny. Totally adorable, my little girl will love checking out this post and giggling at the 'sillwy' owls.